Understanding the mood and mindset of your live chat users isn’t always easy. But that sentiment is there, hidden behind every message you receive, in every chat session that’s completed. Enter live chat sentiment analysis. There are two stages to the sentiment process in WhosOn — real-time chat mood and reflective sentiment analysis. One is quick and supportive; the other is in-depth and useful for post-chat analysis. Here, we explore the reflective side of live chat sentiment analysis. What is live chat sentiment analysis? Live chat sentiment analysis is a WhosOn feature that analyses every chat session for positive and negative mood indicators. It calculates a sentiment score on a scale of 1-100, to give you a view of how your customers feel about your chat service. In the first instance, sentiment analysis detects emotional tones behind your chat messages in real-time. Then, in-depth sentiment analysis happens once the chat session has ended. 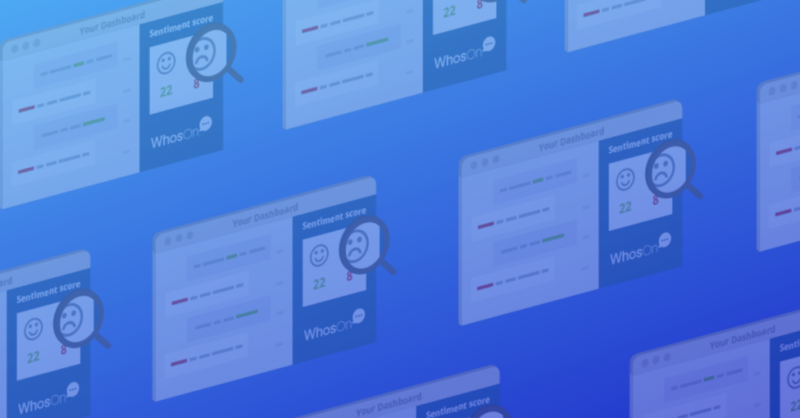 WhosOn cross-references all data (including language, mood indicators and the post-chat survey) to generate a detailed, reflective sentiment score. So, in a nutshell: sentiment analysis is a way to find out customer satisfaction via your live chat channel. Who sees the sentiment scores? It’s entirely up to you to decide which agents can see the in-depth live chat sentiment analysis scores. With WhosOn, you can configure each user’s settings to control which features they can access. So, you can manage who gets to see the post-chat sentiment scores. Most commonly, only supervisors can view sentiment analysis scores. Your agents might not need deep chat reports. Your management team, meanwhile, can use sentiment reports for further analytic purposes. This is only a rule of thumb. If you prefer, you can also choose to make the information visible to your agents, too. Why is live chat sentiment analysis useful? Using live chat sentiment analysis helps you gauge customer satisfaction on both a customer by customer basis, and overall. If a sentiment score is low, you can make sure a follow up is sent to improve the customer experience. Meanwhile, high sentiment scores can indicate good upselling and customer advocacy opportunities. You can also use sentiment scores to measure agent performance in terms of emotional intelligence and empathy. Supervisors get a clear overview of customer satisfaction agent by agent. So, they gain insight into the service quality of each team member and their ability to make customers happy. Live chat sentiment analysis works by automatically monitoring keywords, tone and the syntactic effect within chat conversations. It does this on a line by line basis for every message received. As a result, it ensures no key mood indicators are missed. So, words with positive connotations (‘great’, or ‘happy’, for example) denote a more positive sentiment. Meanwhile, words like ‘unacceptable’ and ‘waiting’ might suggest a more negative sentiment. Once the chat has ended, WhosOn calculates a sentiment score for the session. This considers data from the post-chat survey, alongside the data collected during the chat. Importantly, sentiment analysis gets smarter over time. The algorithm improves with every chat you handle; every new message added to the database. So, the more chats you take and the longer you use live chat sentiment analysis, the more powerful it becomes. With WhosOn, live chat sentiment analysis is automatically completed for every chat session. And it’s just one of the many useful features that WhosOn has to offer. Why not explore further with a 30-day free trial?